Gerald P. Fogarty, S.J. (right), is congratulated by ACHA president Richard Gribble, C.S.C. Gerald P. Fogarty of the Society of Jesus and holder of the William R. Kenan, Jr., professorship in Religious Studies and History at the University of Virginia, earned his Bachelor of Arts Degree at Fordham University in 1964 and then went on to earn six graduate degrees, including his Ph.D. from Yale University in 1969. He specializes in Vatican-American relations and is a genuine scholar who has contributed substantially to our knowledge of American Catholic history. His books are in everybody’s footnotes, his interests and personal knowledge of American Catholic history are outstanding. It was he who pioneered the use of the Vatican Archives for the study of US Catholicism (the new buzz word: transnationalism.) He is tri-lingual (Italian, Latin, and English) and even when people in the profession dismissed any idea of foreign study (who cares what Rome thinks? )–Gerry went ahead and unraveled some of those complicated interactions between the U.S. Church and the Holy See in “Vatican and the American Hierarchy, 1870-1965” (1982) as well as “The Vatican and the Americanist Crisis: Denis J. O’Connell, American Agent in Rome, 1885-1903” (1974); he has continued his Church-State research and publishing with “Relations between the Church in the United States and the Holy See,” in The Jurist (1992); “The Holy See, Apostolic Delegates, and the Question of Church-State Relations in the United States,” in The U.S. Catholic Historian (1994); “Roosevelt and the American Catholic Hierarchy” in FDR, The Vatican, and the Roman Catholic Church in America, 1933–1945 (2003). Presently he is working on a sequel to his Vatican and the American Hierarchy monograph. Gerry has also written a first-class history of the Diocese of Richmond, Commonwealth Catholicism: A History of the Catholic Church in Virginia (2001). And we would be remiss if we did not mention that during his academic career, Gerry has published over 80 scholarly pieces, including journal articles, book chapters, encyclopedic entries, and book reviews. And he has several items ready for the press as we speak. Of note about this priest-Scholar, Gerry Fogarty has always been serious about blending his life as a priest with his scholarship–he considers both a service to the Church. 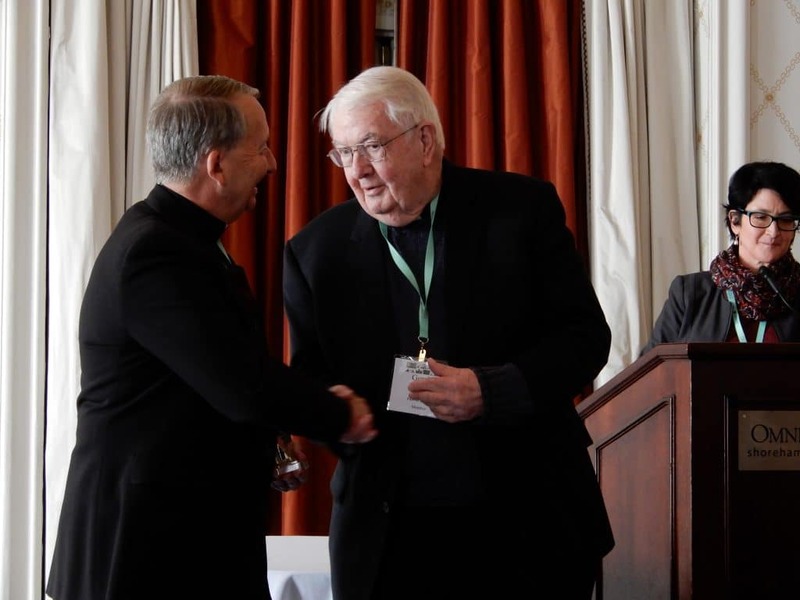 It is for his dedication to the study of Catholicism, his research and his publications that the American Catholic Historical Association presents its 2018 Distinguished Scholar Award to the Reverend Gerald P. Fogarty, S.J. of the University of Virginia.